If you managed to catch our livestream update today with Mark and Andrew, you’ll know we take the “go big or go home” saying to heart. Current stress testing of our building destruction code is on a beautiful TDD-themed castle of over 9 million blocks!!!! Let that sink in for a second. As this thing is destroyed, we’re networking the physics as it falls apart, meaning all the players on the battlefield will experience the same simulation! With a building of this size, the results should be pretty exciting. I saw Ben blowing holes in the massive walls, and was blown away myself by the sheer size of the whole thing. Many thanks to one of our Builder’s Brigade members, Treville, who not only built the monstrosity but is also continuing to help by adding in some BPOs (Building Placed Objects) to not only test our code but also add some lighting to the castle! We’re currently working on pulling a lot of our recent work all together in one place. Will it be easy? Of course not! Are we up for the challenge? If you’ve been in any of our tests, whether they were on massive islands, moving seamlessly between servers, seeing how many different buildings can we support on a server, or engaging in battles on the scale of thousands, you’ll know we are! We are planning on having a test this weekend. Check the info below. More info will follow, as usual, in a separate email. If you missed today’s livestream update and Q&A with Mark and Andrew, you can find that HERE. Keep an eye on our tentative testing schedule for further testing updates. WIP – Art/Design/Tech – New Siege Scenario: For many people, much of this week has been focused on creating a new and exciting scenario to showcase several systems and gameplay pieces coming together. The end goal is a big siege battle, with large-scale multi-plot building destruction inspired by a large-scale battle that most of our Backers will be familiar with (the Helm’s Deep battle, of course!). At this time, the large castle for the scenario, which was built by one of our Builders Brigade, is around 9+ million blocks! We also go big when we test. This is the biggest single building we have used in testing. It should be interesting to see what happens when things really hit it. We hope it is a deeply thrilling experience for many of you. WIP – Tech – ATI Crash: Unfortunately, it seems our fix for the ATI crash issue that we put in last week did not take in all cases. George is working on it right now, and hopefully we will have a fix today, but we wanted to call it out, as we know it is affecting a number of Backers. –LATE BREAKING: We believe we’ve fixed this. Please let us know, ATI card holders, if you still experience issues. WIP – Design – More abilities more classes: Ben has been working hard to flesh out the designs for features that support future classes, as well as balance ability parts and support the team as we build the remaining ability parts out. WIP – Design – A Map of the world: Ben has also been working on designing the map experience, which will play a crucial role in scout classes. WIP – Tech/Design – Abilities: As mentioned last week, we’ve been working on all the abilities that use the improved system. This was ongoing this week fixing various issues and adding additional parts and components as fast as we can. This also includes the continued hookup of existing FX. WIP – Design – Sieges and more: Mark continues to spend time designing/prototyping some of the more interesting elements of our siege system. It has been handed over to engineering today to use as a roadmap for what they need to architect for the system. Mark will do a presentation of it after Ben and Mark’s presentation of the Mage classes. WIP – Tech/Art – Ability Builder UI: Our new ability builder is looking really great–which we know is a tease. We’ve been working on bringing the full interface for ability crafting to life, which should make it much easier to make your own abilities the way you want them. Tech – Rubble Mania: There have been a few pieces of tech we have been working on to really make rubble feel right. This includes timing when we spawn and destroy rubble and blocks. This has gone in, with several other bug fixes and improvements to building destruction. WIP – Art – Animation improvements: Yes, we’ve talked about this one before. This work turned into a bit of a rabbit hole, but definitely in a good way! We’ve basically continued adding improvements to character movement. This week we focused on fixing the blend between walk and run so that players blend between them as their velocity changes, as well as on smoothing out all the jittering that was happening as characters went up and down slopes. This significant work by one of our newer developers has delivered a much improved animation system that you should be seeing in-game very soon. WIP – Tech – Magic Mortars: We’ve added our first round of the magic mortar as a placeable magical siege engine. Though additional iteration on the abilities related to the mortar and the FX are still incoming. Scott has also created animations for it with a bit of an interesting twist He’s currently working on getting them set up in-game. Tech – VFX: A number of technical and art parts of our updated particle and VFX system went in this week as part of the larger client-side VFX work. These items help improve the visuals and make the tools easier for Mike to use. WIP – Characters 2.0 LODs: Work continued on the LODs this week, with Dionne finishing several more assets. Our next step is to begin importing more of these assets, which we’ll consider a first pass. Once we can see them working in-game, we’ll be able to see where we can pull out more polys to improve performance. Tech – NPC updates: We’ve actually been working to improve and add behaviors to our NPCs. This should be visible in testing, and also help us get closer to final NPCs for the game. Art – BPOs (Building Placed Objects): Dionne set up several of our existing assets to work with Matt’s BPO code, so we can use them in our new castle. These will be used not only to light the building, but also to further test the supporting code. 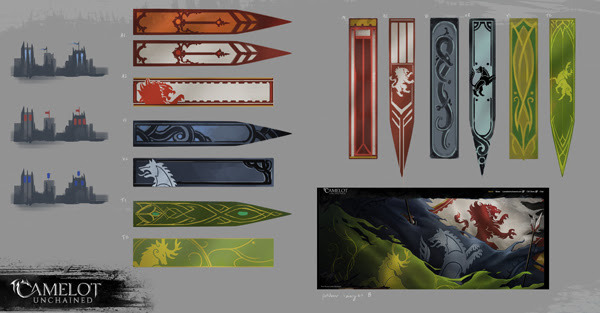 Moving forward, we’ll begin setting up many of our hand-placed assets for Backers to craft and use. WIP – Art – Mage Outfits: Jon finished the TDD outfit this week and completed the modeling of the last outfit for the Vikings. Once the textures are finished, the next step will be to create the various versions for the different genders and races, make LODs of them all, and get them to Joe for weighting, and finally to Ben to get onto the mages’ loadouts. Easy, right?! WIP – Improved Shared Animations: With the bulk of the character 2.0 animation work behind us, Scott is setting up shield, spear, and one-handed sword animations to use our new animation blending tech. This will allow us to share more basic weapon attack animations between characters, while still retaining unique idles to help visually differentiate the classes on the battlefield. Remember when I said we were working to pull all this together? That’s a longer list than usual, with a bunch of fun things we’re throwing in there to improve and test all of this. I mean c’mon, just two siege engines destroying the building? Let’s get those magic mortars in there! Honestly, those are just fun. Check out the image of the animation, below, that Scott is working on. 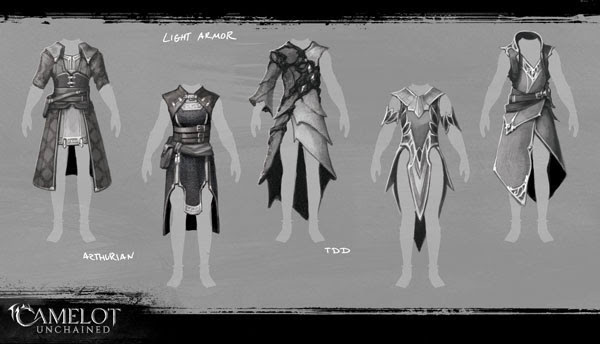 For art this week, we start off with a render of the finished materials for the TDD mage outfit from Jon. You can see the modeling pass from last week HERE. As mentioned above, Scott is implementing an animation set for the magic mortar siege engines. As these are magical, as opposed to mechanical, there’s a bit of hand waving, literally, for the animation as the player aims. Once the player fires, we’ve got the foot slam to trigger the engine to fire. As this was a last-minute entertaining idea from Tim, we’ll probably add a small device to pair the foot to coming off the model. Once the character is working, we can look to add some animation to the magic mortar itself. Think old-school stomp rockets! 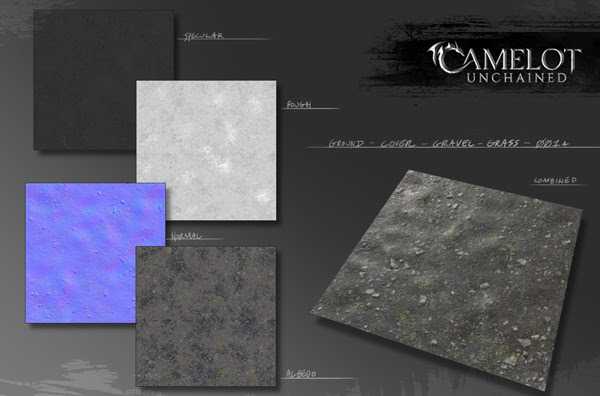 As I, Tyler, work on the new zone, I have been making some new textures, which can be used elsewhere . This is one of many made to support rockier terrain. Michelle made a bunch of flag/banner concepts so we can create some animated assets that players will be able to place on their buildings. 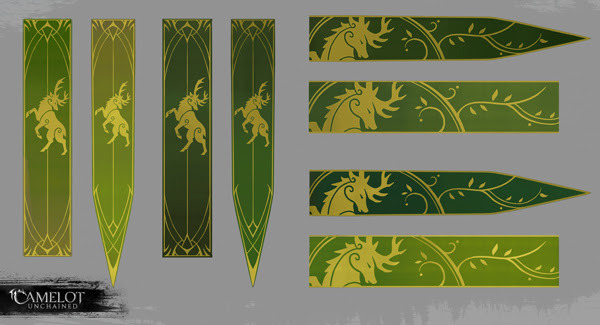 Our first asset will be a large flag to sit atop the Tuatha castle in our new siege scenario. The great thing about this code is it will allow artists to add ambient animations to assets players can use in their buildings (how’s that for some alliteration?)! 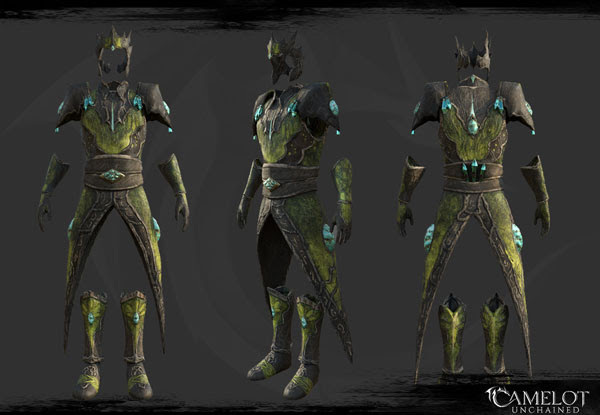 We have several really cool new concepts for new armor and clothing this week, starting with some light robe ideas. 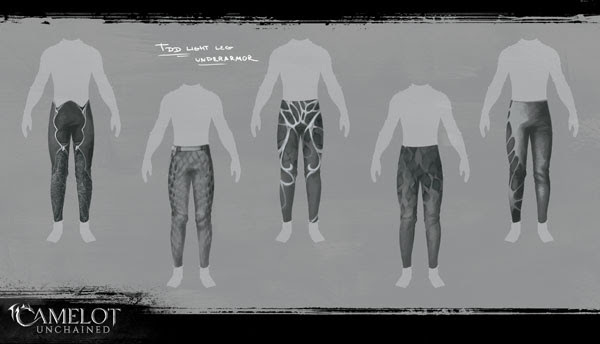 The trick when designing gear for our game is not only making them adhere to the visual design of each Realm, but also making them work with our robust gear system. We’re going to need more than one pair of undergarment pants, ’cause battles can get messy, and you may want a change of pants! That’s it for this week’s update. I hope to see you folks in some of our tests. Remember, our wonderful Backers are invaluable for helping us vet our work! We hope to see you online, in the forums, or in our live streams asking questions. It truly means a lot to us, and to me personally, to get feedback from supportive and enthusiastic Backers like yourselves.